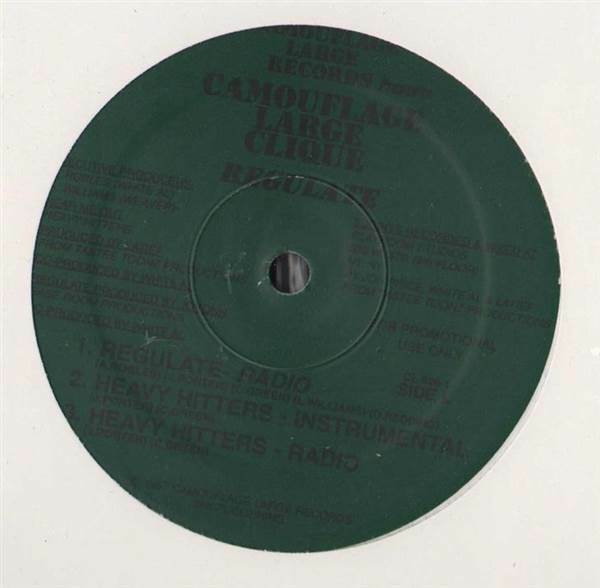 Camouflage Large Clique - Regulate / Hear Me Out / Heavy Hitters 12"
HIP HOP, Camouflage, USA, 1997... Regulate, Hear Me Out (Radio), Heavy Hitters, Regulate (Radio), Heavy Hitters (Instrumental), Heavy Hitters (Radio). Rasheeda - Lets Get To It (Bass Mix) 12" Garcia - None Of Dem / A Double L Attack 12" Omni - Ballyhoo 2X12" Head-Roc - The Return Of Black Broadway 12"
Moe And Don - On The Loose / Rise 12" Badfathers and Tack Fu - Evolution Is Outdated 12" Queen Latifah - Black Hand Side (Remix) 12" Princess Superstar - Bad Babysitter 12"